Needlework: Crochet or knit afghans, sweaters, booties and caps for the babies. People who Sew: Most of the clothing in the layettes is made here in Colorado by many people who sew or serge bibs, receiving blankets, undershirts, onesies, sleepers, burp cloths, gowns, going home outfits and tote bags. 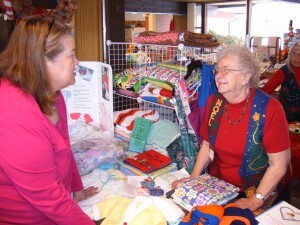 Services: Even if you don’t sew or do needlework, we gladly welcome help in stuffing toys, cutting fabric for items to be sewn by others, delivery drivers, and assembling layettes. Group Fund Raising/Donations: A number of other groups support Warm Hearts Warm Babies by collecting diapers, pacifiers, or toiletries for our layettes.